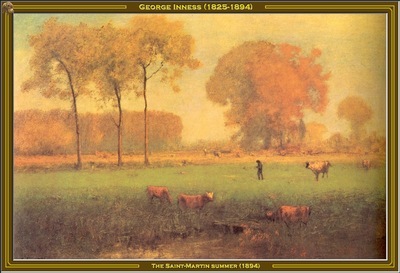 George Inness (May 1, 1825 -August 3, 1894) was an American landscape painter; born in Newburgh, New York; died at Bridge of Allan in Scotland. His work was influenced, in turn, by that of the old masters, the Hudson River school, the Barbizon school, and, finally, by the theology of Emanuel Swedenborg, whose spiritualism found vivid expression in the work of Inness' maturity. He is best known for these mature works that helped define the Tonalist movement.